Material culture in Eastern Europe under state socialism is remembered as uniformly gray, shabby, and monotonous—the worst of postwar modernist architecture and design. 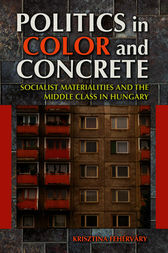 Politics in Color and Concrete revisits this history by exploring domestic space in Hungary from the 1950s through the 1990s and reconstructs the multi-textured and politicized aesthetics of daily life through the objects, spaces, and colors that made up this lived environment. Krisztina Féherváry shows that contemporary standards of living and ideas about normalcy have roots in late socialist consumer culture and are not merely products of postsocialist transitions or neoliberalism. This engaging study decenters conventional perspectives on consumer capitalism, home ownership, and citizenship in the new Europe.